Pursuant to the Constitutional mandate for the provision of free public education at the elementary and secondary levels and to meet the country’s targets in the Education For All (EFA) Plan 2015 and the Millennium Development Goals (MDGs) with respect to primary school participation there is an urgent need to remove obstacles to the enrollment of school-age children. These obstacles include the out-of-pocket costs which families have to bear in the course of sending their children to school. No fees shall be collected from schoolchildren enrolling in pre-school up to Grade IV, during the enrollment period and at any time during the school year. This prohibition shall cover, among others, the authorized but voluntary contributions such as BSP, GSP, Red Cross, Anti-TB Fund and PTCA. 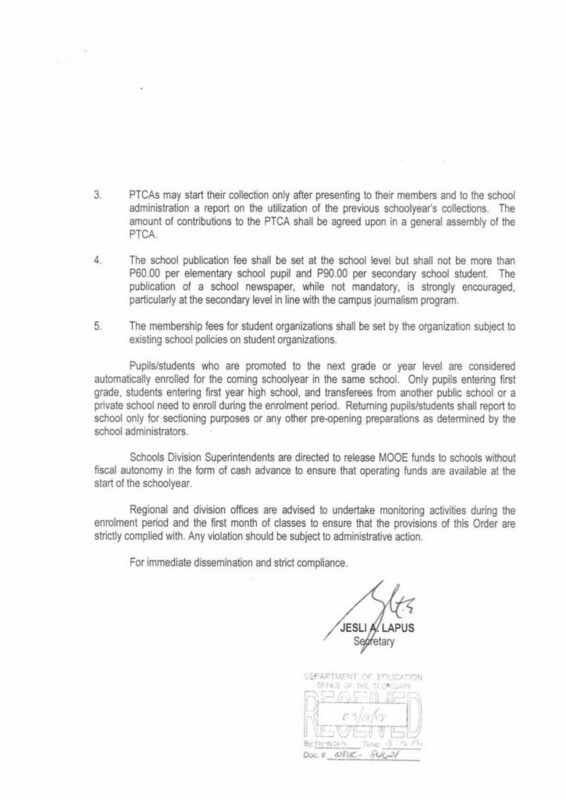 PTCAs may start their collection only after presenting to their members and to the school administration a report on the utilization of the previous school year’s collections. The amount of contributions to the PTCA shall be agreed upon in a general assembly of the PTCA. 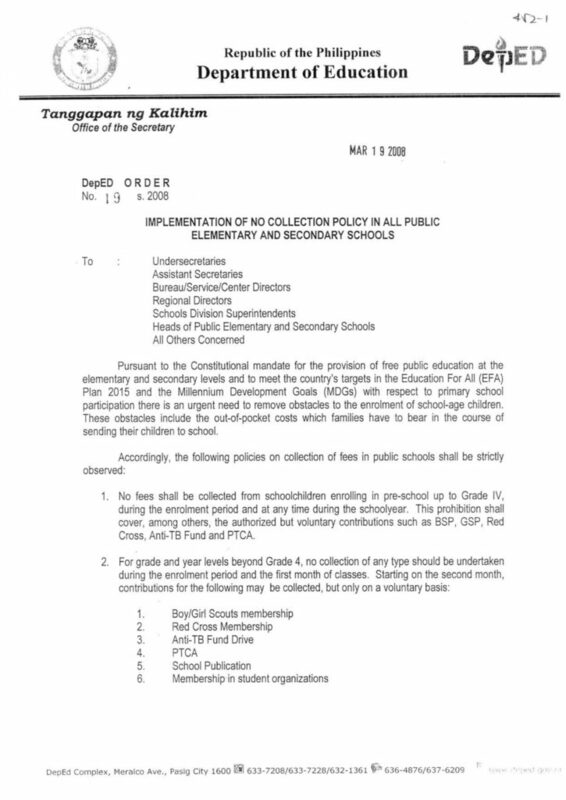 The school publication fee shall be set at the school level but shall not be more than P60.00 per elementary school pupil and P90.00 per secondary school student. The publication of a school newspaper, while not mandatory, is strongly encouraged, particularly at the secondary level in line with the campus journalism program. The membership fees for student organizations shall be set by the organization subject to existing school policies on student organizations. Pupils/students who are promoted to the next grade or year level are considered automatically enrolled for the coming school year in the same school. Only pupils entering first grade, students entering first year high school, and transferees from another public school or a private school need to enroll during the enrolment period. Returning pupils/students shall report to school only for sectioning purposes or any other pre-opening preparations as determined by the school administrators. Schools Division Superintendents are directed to release MOOE funds to schools without fiscal autonomy in the form of cash advance to ensure that operating funds are available at the start of the school year. Regional and division offices are advised to undertake monitoring activities during the enrollment period and the first month of classes to ensure that the provisions of this Order are strictly complied with. Any violation should be subject to administrative action.